MSNBC host Chris Hayes' interview with Apple CEO Tim Cook airing Friday night marks another joint venture between NBCUniversal and Apple, as the giants have made two major deals with each other over the past two years. Hayes, alongside Recode‘s Kara Swisher, spoke with Cook as part of MSNBC and Recode‘s joint "Revolution" series on tech and the future of work. It remains to be seen whether MSNBC will disclose the partnerships between Apple and NBCUniversal at the interview's outset. Apple and MSNBC's parent company struck a deal in 2016 under which the latter became the exclusive U.S. seller of commercial space in the Apple News app, according to Recode. As before, publishers will keep 70 percent of those sales. In a note to her staff, NBCUniversal sales boss Linda Yaccarino said her organization would create a dedicated sales group for the app. Apple News underwhelmed publishers and advertisers when it launched in 2015, and it certainly hasn't gotten the focus that similar efforts, like Facebook's Instant Articles or Google's AMP program, have received. Then last year, Apple announced it would revive "Amazing Stories," the Steven Spielberg NBC anthology television series from the 1980s. Apple made the deal with Spielberg's Amblin Television company and NBCUniversal's production arm, the New York Times reported. Among the excerpts of Cook's interview already released is the Apple chief executive criticizing the Trump administration's decision to rescind the Deferred Action for Childhood Arrivals (DACA) program, which protects immigrants brought to the U.S. illegally as children. 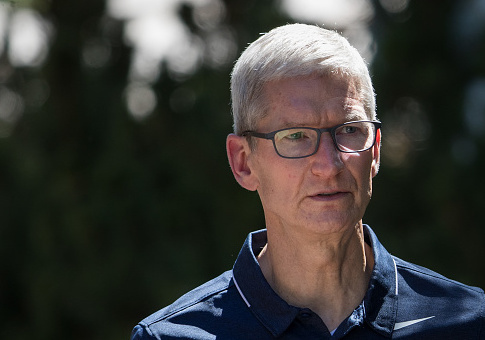 Cook has also made headlines in the "Revolution" interview for his criticism of Facebook CEO Mark Zuckerberg, who is under fire for the social media site's handling of user data amid the Cambridge Analytica scandal. "The truth is, we could make a ton of money if we monetized our customer—if our customer was our product. We've elected not to do that," Cook said. Asked by Swisher what he would do if he was Zuckerberg, Cook said, "I wouldn't be in this situation." This entry was posted in Culture and tagged Apple, Chris Hayes, Mark Zuckerberg, MSNBC, NBC, Tim Cook. Bookmark the permalink.